Why BIWS is Better Than Others? I’m Interested. How Can I Purchase BIWS Programs? Breaking into Wall Street (BIWS) is a ‘self-learning’ financial training program highly in demand by private equity, equity research, and investment banking career pursuers. In fact, not only individuals, businesses and corporate institutions often enroll their staff in BIWS courses to upscale their current skills. You need to understand how investment bankers work and imbibe their experiences in your interviews, such that you appear confident, skilled and an asset to the company. Usually, these experiences are hard to come by because you don’t have access to networks and real-time case studies. This essential shortcoming is sorted by the Breaking into Wall Street courses. In this post, I’m going to write on investment banking training provider -Breaking Into Wall Street training programs. To give an accurate overview, BIWS is not the first finance training program in the world. In 2003, Wall Street Prep started a self-study program in the investment banking sphere. A couple of years later, Breaking into Wall Street and Wall Street Training came into existence. Are BIWS Programs for Me? How Can I Download Sample Videos? First, the BIWS programs offer more value at a lower price. Second, their course quality is higher. Third, they have excellent community and one-on-one support. Fourth, they conduct live case study analysis. Fifth, they offer lifetime access to the site, free upgrades, new content as they add it and expert support. Sixth, you get BIWS certification which is highly valued among the financial community. Seventh, fully downloadable material to almost any device, including iPads, iPhones, iPods and all desktops, laptops, tablets and smartphones. Eighth, vibrant BIWS student community (22,981+) accelerates learning, read Testimonials. Tenth, Test Drive BIWS for FREE. And, Easy Payment options: Credit Card and PayPal. Most of you read FinanceWalk for financial analysis, financial modeling, investment banking and equity research related posts. I get queries from readers about financial modeling and investment banking training. The BIWS program and certification are conceptualized by Brian DeChesare, who is also the founder of the very popular Mergers & Inquisitions. The program is trusted and used by over 150 finance firms, 150 schools, and universities in over 75 countries. Many companies even prefer to see BIWS certificate from the candidate before offering a position. To clear the BIWS certification, you need 90% score and there is a high focus on self-testing. Practical knowledge is imparted which immensely helps a candidate to clear interviews. Your practical knowledge is tested, and you get learning opportunities to learn from experienced investment bankers. FinanceWalk has partnered with Breaking Into Wall Street (BIWS) to provide Excel, financial modeling, investment banking, and private equity programs. BIWS is a leading and highly trusted online training provider in the US. The BIWS programs are used in over 75+ countries, 150+ Schools and Universities and, 150+ Finance Firms and other Corporations. Brian DeChesare. Brian created Mergers & Inquisitions in 2007 based on his experiences starting Internet-based businesses, working in technology, and then in the investment banking world. He has been a featured speaker on business, finance, and recruiting at leading universities and business schools around the world. Let’s see the programs offered by BIWS. BIWS provides online programs in Excel, financial modeling, and investment banking. BIWS offers following online programs in Financial Modeling, Investment Banking, and Industry-Specific Modeling. Please note that FinanceWalk is a BIWS partner. You get $97 bonus when you buy any program through the following links. BIWS programs are helpful for people who want to make a career in investment banking, private equity, hedge funds, equity research, corporate finance, real estate and oil & gas modeling. Helpful for everything since the same networking strategies apply in all fields of finance. A course beneficial if you’re entering the investment banking industry, the networking toolkit teaches you proven ways to establish and build contacts in the banking industry through a 9-step process. You learn how to convert interview requests into real meetings, learn to handle cold calling, and learn to create a favorable impression. Helpful for investment banking / private equity / equity research / corporate development interviews. If you want to crack private equity, investment banking, equity research and corporate development interviews, check out the BIWS investment banking interview guide. The guide walks you through gaining ‘unfair’ advantage over competitors and cracking the interviews. You are taught “fit” questions asked in almost every interview, given 15 resume templates, taught technical questions and the concepts behind it and you’re also given access to 326+ practice questions. Learn Financial Modelling. Helpful for investment banking / private equity / equity research / corporate development. This course is useful for those going into equity research, private equity, investment banking and corporate development interviews. You master financial modeling and valuation using Excel. You are taught both conceptual and practical expertise with real-life case studies. Helpful for investment banking / private equity / equity research / corporate development. If you already know financial modeling but seeking a higher level of expertise, this course is custom-created for you. The course teaches how investment bankers use financial modeling in real life scenarios. You are taught a detailed operating model with projections, valuations using nine methodologies, advanced LBO modeling, and advanced merger models. Helpful for real estate-focused investment banking / private equity / equity research / real estate/ corporate development. You can learn REIT financial modeling and real estate and ace investment banking interviews through real-life case studies and video tutorials. You are taught applicable concepts and skills to dominate interviews. You are taught using REIT equity research and SEC filings. You learn detailed models like Hotel Acquisition and Renovation, Office Development and Sale and REIT Operating Modeling and Valuation. Helpful for energy or natural resource-focused investment banking / private equity / equity research / Oil and Gas/ corporate development. The course is useful for natural resource-focused or energy-focused private equity or investment banking interviews. You have access to video tutorials and a case study based on 41 billion USD M & A deal. You are taught to master all the nuances of oil and gas industry, accounting, statement modeling, LBO models, merger models and valuation. Helpful for financial institutions-focused investment banking / private equity / equity research / corporate development. As with all other BIWS programs, this too makes use of video tutorials and real case studies (SunTrust Banks and JP Morgan) to teach financial institution modeling. There are quick reference guides and concepts on interest-bearing liabilities, interest-earning assets, credit losses, loan losses and more. PowerPoint Pro 2.0 is the only course on the market at any price that teaches you how to master PowerPoint as it is used in investment banking, private equity, hedge funds, and other finance roles. Here’s How to Master PowerPoint So You Complete Investment Banking Pitch Books and Buy-Side Investment Recommendations in Half the Time and Move Straight to the Front of the "Top-Tier Bonus and Promotion" Line. BIWS offers following online programs in Excel, Financial Modeling, Investment Banking and Industry-Specific Modeling. All FinanceWalk readers will get FREE $97 Bonus - FinanceWalk's Equity Research Program. If you want to build a long-term career in Financial Modeling, Investment Banking, and Private Equity, I’m confident these are the only courses you’ll need. ( Because Brian (BIWS) has created world-class online financial modeling training programs that will be with you FOREVER). 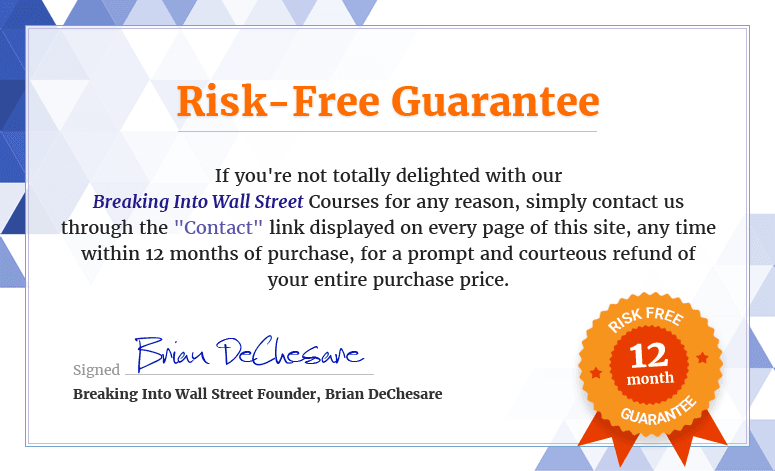 If you purchase BIWS courses through FinanceWalk links, I’ll give you a FREE Bonus of FinanceWalk's online Equity Research Program ($97 Value). I see FinanceWalk's Equity Research Program as a pretty perfect compliment to BIWS courses – BIWS helps you build financial modeling and investment banking skills and then I will help you build equity research and report writing skills. Purchase the course through FinanceWalk links. Send me an email along-with your full name and best email address to [email protected] so I can send you the course login details. Just click on the "Sample Video" button. You will be taken to the video page. hey i want to learn financial modelling . kindly let me know the procedure and fees for it . I am interested in the discount and coupon code that you were talking about. Right now, there is a discount on combo package. Please let me know which courses you want to join. I am also interested in the discount. I am interested in the BIWS Premium package. Thanks Avadhut. The BIWS Premium Course is already at a discounted price ($197 Saving). I am Chartered Accountant bv qualification. I want to make career into core finance (Financial Analysis to be specific). Kindly suggest some courses which can help me get into core finance areas. You can join BIWS Courses or our classroom program in Delhi for core finance careers. This is Krishna . I had completed my degre (b.sc)frm ou university.sir I am interested in investment banking companys like Goldman sachs&co.i got interest because i read a book (one indian girl) iam so inspaired of that.though iam not so smart. I wnt to ask u that.which course should I take in MBA so that I can apply to Goldman. Take Finance and Investment Banking in MBA. Do MBA from IIMs or ISB. sir i am in bba and i want to do investment banker course so suggest about this course. You can join BIWS Courses or our classroom program in Delhi for investment banking careers. At present, BIWS is not providing any discount. You will get a FREE Bonus ($97-Value) when you join any BIWS program through FinanceWalk’s links. i come from a engineering background. i am new to the finance world and i am currently getting a degree in finance. am i qualified to enter this program. or will it be best if i Finnish my degree first before engaging in such a course ? You are most welcome to join BIWS programs. You can join BIWS Courses or our classroom program in Delhi for core finance/ financial modeling/ investment banking careers. I have given my CA Final (only 3 papers remain to clear) this May and CFA (US) level 3 day before. I’m awaiting results for both and am confident about clearing CA Final. I’m a fresher and wish to join in either a firm that manages wealth of sports clubs or players, or some field in investment banking (preferably front office). Talking to some friends I got to know that freshers can’t break in the front office and also that the policy of transfers from back to front office is almost done away with by the firms. Please guide me. Excellent BIWS review. I downloaded the videos and got the $97 bonus from you too. I’m also interested in GMAT Pill online course. Can you email me the Discount Coupon Code for the same? You can get the Discount Coupon Code and FREE Bonus here. I want to know GMAT Pill Discount Coupon Code. Can you tell me more about BIWS Discount and Bonus that you provide? I am fresher cfa(icfai) & finished with FATP I want to join KPO Or give me other option and what i must prepare practically to be an Analyst. Please read this KPO Guide and start taking the steps mentioned. You can apply to these financial KPOs. Please check this guide to start your career as an Equity Research Analyst. Please let me know your queries AFTER you read these articles.